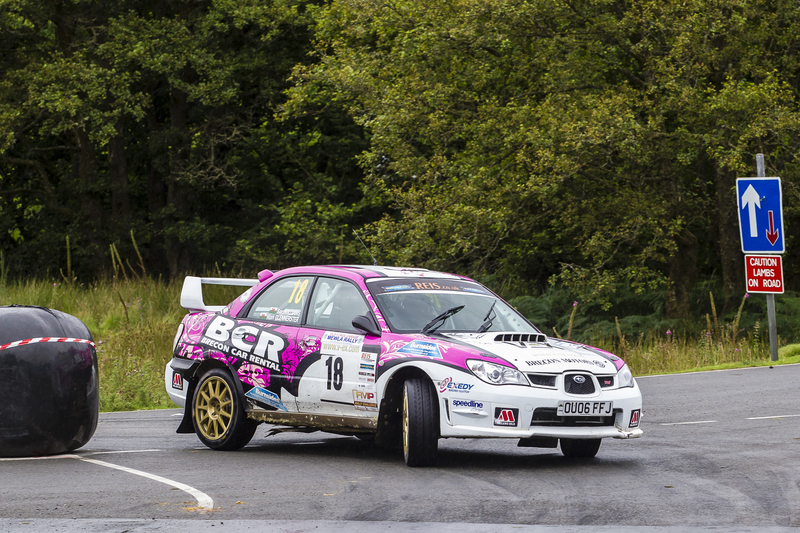 British female number 1 rally driver Sara Williams kept the pressure on in the BTRDA Rally Challenge Championship with another impressive display at the Mewla Rally 2015. 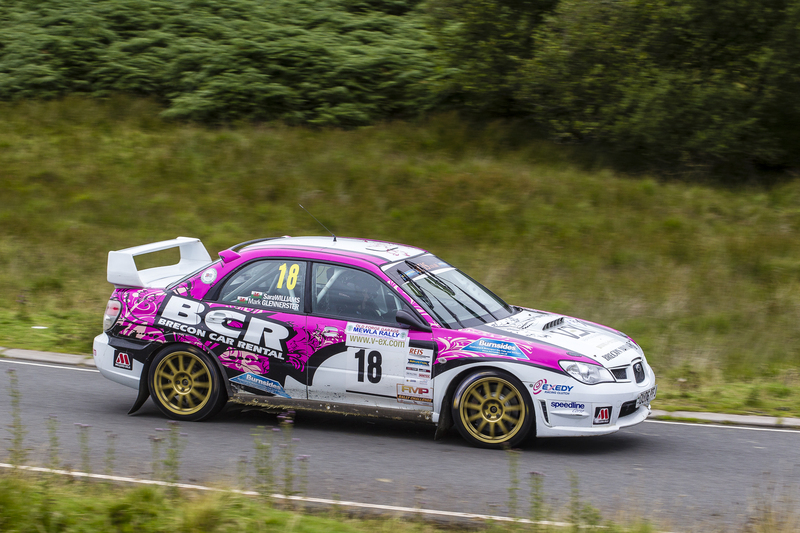 Finishing 4th in class and 14th overall, Sara and co-driver Mark Glennerster again proved that their pace is not restricted to gravel surfaces. Combating wet conditions and the tricky tarmac of the Eypnt Ranges, Sara posted a clean and accomplished performance. 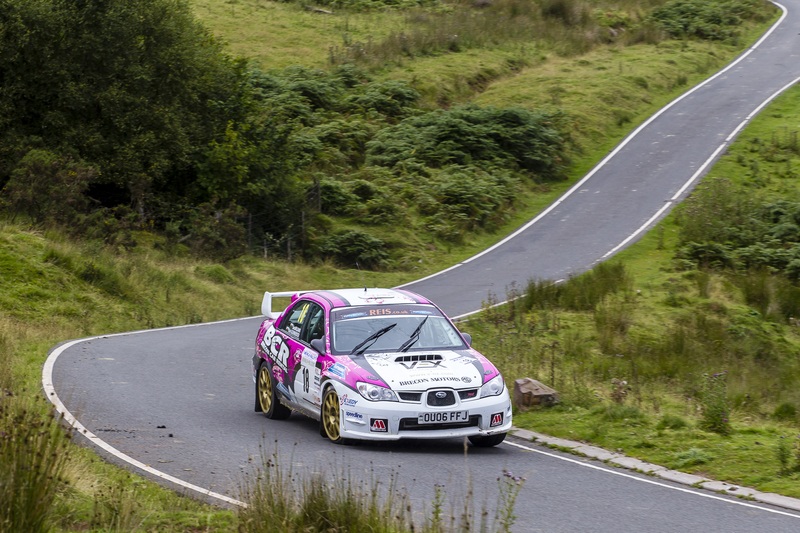 Organised by Epynt Motor Club, the Mewla Rally encompasses 80 stage miles over the tarmac roads of the Mynydd Epynt. Falling on the 20th August 2015, the rally saw 105 competitors take their rally machines to the picturesque rolling hills in the hope of scoring important points as the season nears its climax. Plenty of spectators also took the walk up the hills to the stages, cheering on a wide range of rally cars of different ages and classes. Conditions on the first stage were favourable, with the road dry and visibility good. 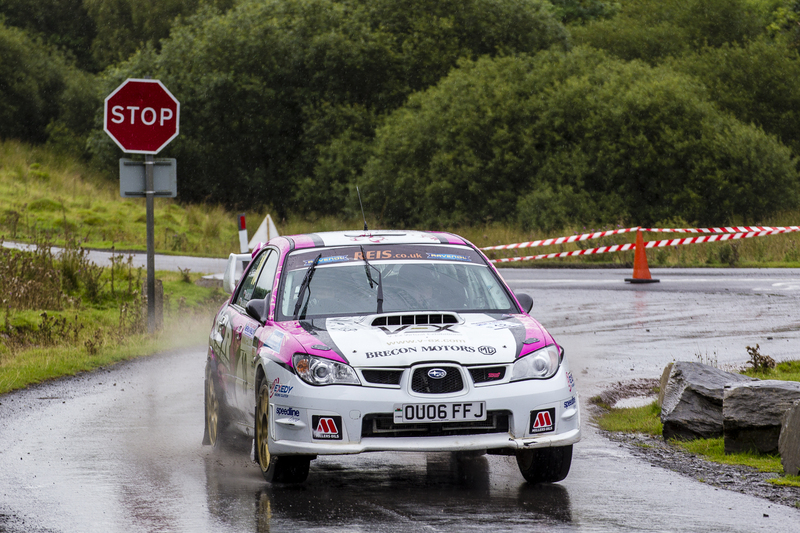 After SS1, Old Forge Garage, Sara and Mark found themselves joint 21st overall. However the fireworks began for the duo on the 3.85km SS2, Dennis Motorsport, as at the end of the stage Team Brecon Motors were running joint 18th on the road and had climbed from 5th in class to 4th. Stage 3, Crossing Garage, presented many challenges to the drivers. Firstly, an inconsistent road surface of concrete slabs made for a change in grip levels. To further compound this, the surface led into the village section of the stage – an enclosed area that required finesse through a long series of tight bends. The village lead out into faster sweeping bends and great undulations. Sara and Mark dropped two places in a congested top 20, with only 12 seconds separating the 5 drivers ahead of her. SS4 Basic Romer is characterised by misleading crests, tightening bends and occasional sharp corners. Furthermore, intermittent rocks on various corners made cutting the apex a very dangerous game, testing the co-drivers pace notes. Sara and Mark kept it consistent and held position. One of the faster stages run during the day, Whitehall Hotel was the fifth trial for the drivers. Featuring longer straights, SS5 can catch inexperienced drivers out with a mixture of crests and off camber bends which can easily send cars into the Eypnt scenery at high speed. By stage end, Sara had jumped to 19th position overall while still holding 4th in class. However the dry conditions enjoyed earlier in the day were not to last. What began as a few ominous clouds materialised into rain, the tarmac becoming slipperier with each drop. This would not deter Williams. Stage 6 resembled a mix of the features in SS3 and SS5. The stage first channels drivers into a technical slower speed section before catapulting them into fast sweeping bends lined with rocks and Armco. Sara held her overall position. The rain had grown more persistent, and it had become clear to all the drivers the remaining stages would not dry out before rallies end. The event had now become a test of who could gain the most grip out of the drenched course. Belle Vue Hotel, stage 7, is not for the faint hearted in wet conditions. Misleading straights lull drivers into tight corners and crests which can throw a cars balance. Sara however kept her foot in, shooting up 3 places to 16th overall. Stage 8 saw the competitors check in to another hotel, Lasswade Hotel. However room service was not on offer for the drivers, with Lasswade instead providing long climbs, drops and a fast finishing sector with narrow tarmac. With the rain coming down more persistently now, Sara hustled her V-Ex Virtual Exhibitions Subaru Impreza up to 15th overall. With the weather still worsening, Sara set about increasing the pressure on the cars ahead of her. On SS9 Sara set the 8th fastest stage time, then to enforce her intentions set the 10th fastest time on SS10 to push her and Mark to 14th overall. The final stretch of tarmac for the BTRDA Rally Challenge season made for a stern test for the drivers. With the bad weather reaching its climax, the teams were presented with twisting shimmering vein of tarmac. Zooming past the disused building and navigating the tricky hairpins, Sara set another scintillating 8th fastest stage time. This performance brought Sara and Mark to 14th overall and 4th in class, a vital result with the season nearing its close. The next destination for Team Brecon Motors and Sara is the Trackrod Rally 2015 in Yorkshire. With the action taking place on Sara’s preferred surface, everyone who knows William’s expertise will be waiting with great anticipation. Photo Caption 1: Sara Williams and Mark Glennerster navigate the numerous hazards and wet tarmac of the Eypnt during the Mewla Rally 2015. Photo Caption 2:The stages are characterised by flowing and undulating tarmac which can catch out the unwary. Photo Caption 3: Sara and Mark take a sharp right-hander at the Mewla Rally 2015 in the V-Ex sponsored Group N Subaru Impreza. Photo Caption 4: Sara and Mark finished the rally 4th in class and 14th overall.